All about that BEEF! | On the Banks of Squaw Creek: All about that BEEF! 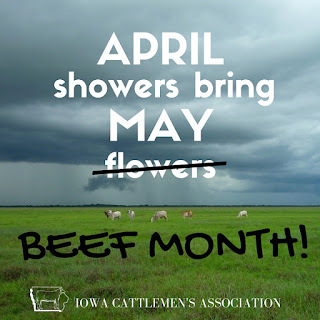 That's right, I know you're used to hearing about turkey on this blog, but May is Beef Month! 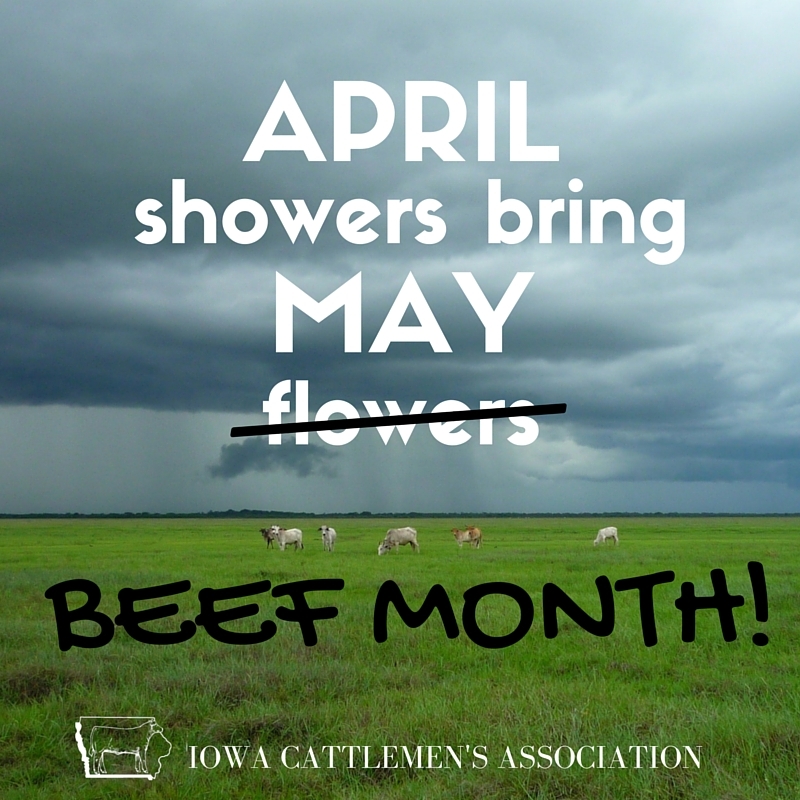 Since I started working for the Iowa Cattlemen's Association last fall, I've learned a LOT about cattle and beef production. And when I say a lot, I mean, a lot. Don't tell my boss, but when I interviewed for the job, I had a hard time remembering the difference between a steer and a cow. Now, I'm able to actively participate in conversations about best weaning practices and cattle handling and feed efficiency and pasture management. I'm not an expert, by any means, but like I said, I've learned a lot. Here are 5 of the most surprising things I've learned over the past few months here. 1. Almost all cattle are grass-fed for the first 6 months of their lives. Mama cows are grass-fed their entire lives, as are most bulls. 3. Cattle farms that are combined with row-crop farms can improve conservation efforts. For example, many row-crop farmers use cover crops, but don't make any profit from the practice. Farmers with cattle can bale their cover crops or graze their cows on cover crops, making them a valuable feed source, not JUST a conservation practice. 4. There's SO MUCH SCIENCE that goes into cattle production. I sort of already knew that because there's SO MUCH SCIENCE that we use on our turkey farm. But still, I'm astounded by the amount of research that has led to modern farming practices. 5. This one is from two of my co-workers, who didn't have a background in the cattle industry before working here. They are both amazed by the dedication and passion that cattlemen show each and everyday. And they are impressed by the fact that cattlemen truly care about the environment, their animals and the quality of the end product. A farmer's passion is hard to describe if you haven't witnessed it first-hand, but it is truly amazing. Want to know more about the cattle industry? I have some exciting news... earlier this spring, I completed my 2nd non-fiction children's book: My Family's Beef Farm. Click to read the book online! I worked with the Iowa Beef Industry Council, the Iowa Agriculture Literacy Foundation, and photographer/designer Jenn Hindman to put together this children's book. The book features Cecelia, whose family raises cattle in here Iowa. In the book, which is written at a 3rd grade reading level, Cecelia explains all the aspects of her family's beef farm, from beginning to end. There is also supplemental text on each page for older kids, teachers or parents. This book follows the same format as my first, My Family's Farm, which was about our turkey farm. I love that both of these books provide kids a look at modern livestock farms and provide teachers with a non-fiction book they can use in their classroom. The Iowa Ag Literacy Foundation has also put together GREAT resources for teachers to go along with the book. In addition to science and math lessons (tied to Common Core standards, of course) there are also tips for using the book in a language arts or reading lesson here. Although I'm not a teacher anymore, I would have LOVED to use these resources in my classroom.